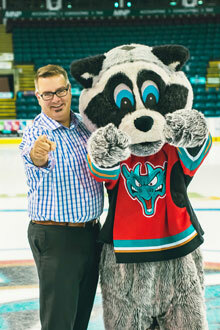 HatTrick participant Kevin Lavigne and poses with Kelowna Rockets mascot Rocky the Raccoon. Caperchione is now looking for recruits for the first session that begins in January. Each 90-minute weekly session will be led by healthy lifestyle experts from the research team, Kelowna Rockets staff (e.g., trainers, nutritionist), and other community health professionals. During these sessions participants will have the opportunity to be physically active as well as learn simple tips for healthy eating and active living.